Nxabega Okavango Camp is a luxurious Botswana safari camp offering outstanding safari accommodation on the edge of the magical Okavango Delta, near the Moremi Wildlife Reserve. Situated near permanent water, &Beyond Nxabega Okavango Safari Camp offers a water wilderness experience as well as awesome land game viewing. Activities at Nxabega Okavango Delta safari camp include guided walking excursions and guided mokoro excursions throughout the year except around January and February. Night game drives at this Okavango Delta safari camp are an unforgettable experience. Guests at Nxabega Okavango Delta safari camp can indulge in delicious Pan-African cuisine. Nxabega Okavango Camp has a magnificent elevated main building constructed in local timber, reed and thatch overlooking a floodplain. 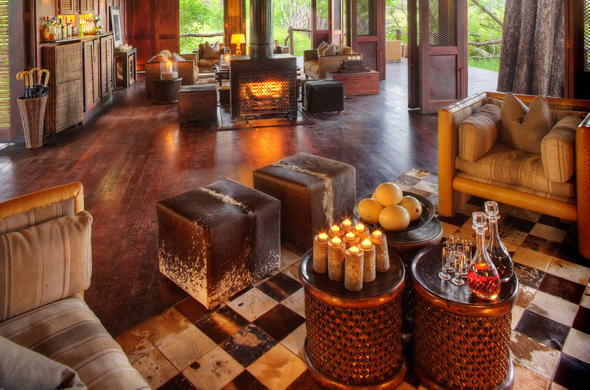 This Okavango Delta safari camp has a dining room, lounge and expansive sundecks where guests can relax. There is an outside dining and campfire area, swimming pool, curio shop and interpretive centre/museum at this Okavango Delta safari camp. Nxabega Okavango Delta safari camp welcomes all children. Regretfully, children 5 years and younger cannot participate in the regular game drives. Children aged 6 to 11 years are accommodated on game drives at the lodge manager's discretion. An extra bed can be arranged for a child sharing its parents' tent and child minders can be arranged at an additional cost. Nxabega Okavango Safari Camp boasts expansive sundecks where guests can relax and soak up the African sun.